Alessandro Faedo was usually known as Sandro Faedo; in fact almost all his papers are written under the name Sandro Faedo. His father, Marco Faedo, was a merchant, and his mother was Armida Peretti. Sandro was the oldest of his parents' five children, all sons. Sadly, Sandro was still a child when his mother Armida died. His secondary education was at a boarding school in Padua. After graduating, he studied at the Scuola Normale Superiore in Pisa where he was taught by Leonida Tonelli who had been appointed to Pisa in 1930. The Scuola Normale was originally founded in 1810 by a decree of Napoleon Bonaparte and intended to be a sister institute of the École Normale Supérieure in Paris. It had become an institute of higher education linked to the University of Pisa in 1932 while Faedo was studying there. He obtained his laurea in 1936 after writing a thesis with Tonelli as his advisor. The topic of the thesis was the Calculus of Variations and he developed ideas on the "direct method" introduced by Tonelli in the 1920s. After graduating, he was appointed as a substitute lecturer in geometry at the Scuola Normale in Pisa. 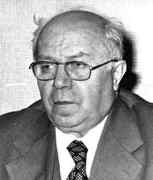 His early publications include: Ordine di grandezza dei coefficienti di Eulero-Fourier delle funzioni di due variabili Ⓣ (1937) and Sulla sommabilità per linee e per colonne delle serie doppie di Fourier Ⓣ (1938). During the winter of 1936-37 [Faedo] met Enriques who arrived in Pisa with the alleged purpose of meeting the students of the Normale, but he really wanted to find among Tonelli's students an assistant who could take the place of Campedelli, who had become a professor. Enriques' choice fell on Faedo, who moved to Rome in March 1937 after overcoming certain perplexities associated with the relocation and to the discipline itself (geometry) in which he had not earned a degree. The following year Faedo substituted for Enriques, teaching his courses for a brief period during his trip to Scotland for an honorary degree [from St Andrews University]. Tonelli spent the early part of the week in Rome, where he arrived on Monday and left on Wednesday. Faedo helped him with the small issues related to a new residence and their relations became less "professional". ... In Rome Faedo developed relationships with Severi and Picone but ... there were a few problems. Applying the theory of the circular elastic plate of variable thickness the author determines the deformation of a spherical biconcave or biconvex lens supported by a circular ring and subjected to a uniform pressure on one side. ... sets down a rule for selecting a definite function from an arbitrary closed class of continuous functions of a single real variable. The functions of the class need not all be defined on the same interval, and the intervals of definition may be finite or infinite. The presence of Faedo in Pisa marked a turning point for Pisan mathematics. With his great energy and his skills as an organizer, innovator and promoter he rebuilt a great mathematical school and revitalized the Mathematics Institute in Pisa bringing it to levels of absolute excellence. From 1958 to 1972 he was Rector of the University of Pisa. Early in his tenure he was able to secure the appointment as professors of an amazing constellation of mathematical talents including Aldo Andreotti, Jacopo Barsotti, Enrico Bombieri (who was to receive the Fields medal in 1974), Ennio De Giorgi, Guido Stampacchia, Gianfranco Capriz, Giovanni Prodi and many other scholars. From the mid-1960s onward, Faedo essentially ceased his research activities to dedicate all his time and energy to his work as a manager and organizer. This method, which has since become classical, has been widely applied and extended by a number of researchers and has been shown to be an effective tool, both computational and theoretical, in the study of complex problems such as the Navier-Stokes system in incompressible fluid dynamics and many others. Let us return to our discussion of Faedo's other achievements. At Pisa he held a number of positions of importance, for example he was dean of the Faculty of Science from 1953 and rector of the University of Pisa from 1958 to 1972 succeeding Enrico Avanzi. He realized the need to establish a permanent conference of rectors of all Italian universities and he was appointed the first president of that body. One of his most significant achievements as rector was his efforts to bring the teaching of computer science to Pisa. He established the degree of Master of Science in Computer Science at Pisa in 1969, the first degree in Computer Science in Italy. This aspect of Faedo's contributions are important and we describe in more detail how this came about. Enrico Fermi saw the importance of computer science and approached the rector of the University of Pisa, Enrico Avanzi, suggesting that the university should be involved in these new highly significant developments. The text of Fermi's letter is at THIS LINK. Towards the end of 1954, the rector asked Faedo to set up a team to look into building a computer. The Centro Studi Calcolatrici Elettroniche was set up and Faedo's team, which included physicists and electrical engineers, designed and built the Calcolatrice Elettronica Pisana. Completed in 1961 and inaugurated on 13 November of that year, this was the first computer designed and built in Italy. Faedo served on the steering committee of the Centro Studi Calcolatrici Elettroniche from 1954 to 1958. Realising that the United States had become the world leader in computer technology, Faedo visited the United States in the early 1960s to learn more about the most recent developments. He was able to purchase an IBM 7090, which at that time was the best and most powerful computer in production, for the University of Pisa. In 1964 Faedo founded the National University Computing Centre as a part of the Italian National Research Council. Despite many recognising the significance of computing developments, other colleagues of Faedo's did not see this as more than a passing phase of little or no academic significance. It is a tribute to his belief and his ability to persuade his colleagues that he was able to oversee the setting up of the Master of Science in Computer Science at Pisa in 1969. He had to ensure that Pisa had staff with the skills necessary to teach this new topic and he was able to appoint a number of young computer scientists, most of them from Milan. The Italian National Research Council saw Faedo's abilities and achievements at Pisa and elected him as their president, a role in which he served from 1972 to 1976. Of course, the Italian National Research Council was involved in many developments in addition to computers, in particular the Sirius satellite program. Faedo played a leading role in the successful launch of this satellite for research into the use of new very short wavebands for telecommunications. In 1976 Faedo's term as president of the Italian National Research Council came to an end. One might have though that after this period of intense organising and administration, Faedo might have looked for a quieter time. However, he went in what one might call exactly the opposite direction beginning a period of intense parliamentary activity. From 1976 to 1983, he was elected to be a Senator of the Italian Republic, serving for two terms. His educational expertise was put to good use by appointing him as chairman of the Senate Education Committee. In this role he was responsible for overseeing major reforms in the Italian university system. Faedo married Irma Sulis, a graduate in Chemistry. They had four children, three girls and a boy, and their eldest daughter, Lucia Faedo, became professor of Roman Archaeology at the University of Pisa. With the light of his knowledge, the charm of his personality and the mature wisdom throughout his long career, he has given the Olympic Academy an operating boost and new prestige. It was in fact the cream of Italian mathematics which met in Pisa. All mathematicians of the highest level, who were often enticed by offers from prestigious foreign universities, it was Faedo who "chased and hunted" them with obstinacy, sometimes having to overcome tough resistance or overcome bureaucratic obstacles. Under Sandro Faedo's fatherly, caring and enlightened leadership (true "guardian angel" of our Institute, as affectionately defined by playful Edoardo Vesentini), there was a spectacular revival of mathematics in Pisa. Pisa was not only placed at the top in Italy, but assigned a respectable position on the international scene. Today the members of the department in Pisa and, more generally, members of the Italian mathematical community, are mostly students, direct or indirect, of the masters of that glorious period. It is natural that they look to Sandro Faedo with affection and gratitude.